To assist our members in trading water we have set up a water trading register and made it available to all members wishing to buy or sell water. All negotiations are to be between the buyers and sellers, Gascoyne Water has no part in the pricing of water. Every member listed on this page is required to register their details in the GWC office and sign an interest in trading water form to allow their information to be made publicly available (please see bottom of page). Please come in or give us a call on 9941 4488 to put your name down for temporary water or list your water for trade. We are always here to help. GWC Members who wish to sell water can pre-sign a water trading form for the amount they wish to sell, members are required to set the price for the water they are selling before signing the trading form. A buyer will then sign the trade form and GWC will call you to collect payment. Please note: If members use this method the trade will be applied at the time the buyer signs and leaves payment in the office. The seller is responsible to inform GWC if the trade falls through. How does Water Trading work? All members with spare water at any time of the year are able to temporary trade part of their allocation with another member. The negotiations and payment for temporary water trades is done between members who agree on the price and quantity of water to be traded. Temporary trading is a way for growers to recoup some of their annual water charges and free up water they won’t be using by trading with someone who may need it more. GWC are here to assist growers so that the trading process is simple and not burdensome. If a grower wishes to buy temporary water they can notify GWC of their needs and we will keep their details on file and pass them onto a grower wishing to sell temporary water. 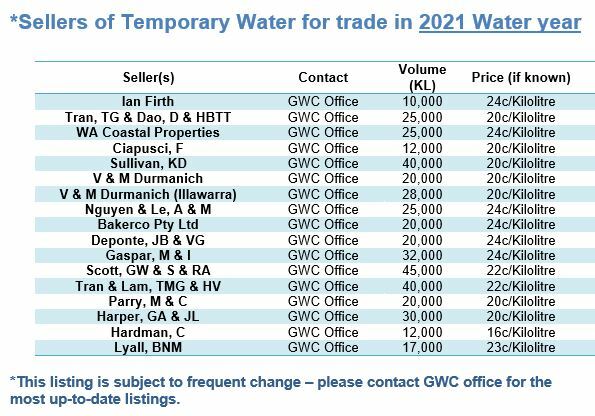 If a grower wishes to sell temporary water and doesn’t have a buyer, they can notify GWC who can then give them a list of growers who have expressed interest in temporary water. You don’t have to run around the river wasting your valuable time but you still have to set the price, negotiate the deal and arrange the payment between yourselves. We are also happy for cheques to the buyer to be left at the office for collection if this suits the growers involved. Please note: Please be aware that if you are buying/selling any water and you have outstanding accounts with GWC or GWAMCO, you will be required to pay off those accounts in full or if agreed by GWC Management, the monies raised from your temporary sale must be put towards your outstanding account otherwise the trade may not be processed by GWC. If you are a buyer and have outstanding accounts, unless you are on a payment plan arrangement, the trade may not be processed until those debts are cleared. 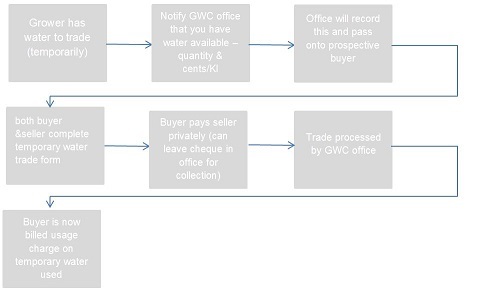 GWC have the right, as outlined in the Rules, to decline the processing of any water trade if any accounts are outstanding by either the buyer or the seller. It is important to check with GWC as to the likelihood of your trade not being processed due to outstanding debts prior to payment between growers. It is the growers responsibility to ask upon enquiring and GWC will not be held liable if a trade is not processed and a grower is out-of-pocket for the water.